There is a lot of controversy about the potential of the Help to Buy scheme to restart the housing bubble. I must say that I share this concern and am disturbed by the thought that Osborne may be deliberately reflating the value of the housing market to enable himself to portray the government as having tackled the problem of the deficit. To portray this policy as one of compassion for the homeless, and to encourage homeowners to celebrate rising house prices, as Cameron did on the Andrew Marr show yesterday, is disingenuous. The PM may sanguinely say people can afford these high-proportion mortgages but how much do interest rates need to rise until this is no longer the case? Cameron used the example of two people earning £20,000 or £25,000 per year and an average house price of £200,000. Leaving aside the 5% deposit to make the maths simple, the BBC mortgage calculator indicates that if interest rates rise to only 3% this couple will now be paying nearly £1000 a month to fund their mortgage. Clearly the Tories think that offering young people homes financed through large amounts of debt will be politically popular, but the historic pattern in Britain of high and rising house prices and high rates of home ownership financed through a mortgage actually serves the financial sector much more than it serves British citizens. The explanation is simple: if your house costs twice as much you pay the bank twice as much in interest. 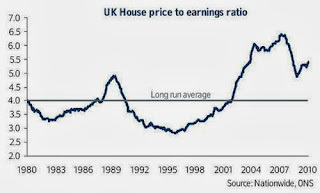 Useful data from the land registry indicates that the house price index has risen to more than 250 compared with January 1995 (the graphic indicates the ratio of prices to earnings during this period). At its peak before the crash the index reached nearly 300, which means that prices had undergone a threefold increase net of price inflation. As I teach my students, because of the compounding nature of interest, you are likely to pay back something like double the principal when you take out a loan over 25 years. This means that when house prices double, twice as much is paid back to financial corporations in interest. No wonder that those with friends in the City encourage us to celebrate house price rises. House price inflation serves financiers and those who welcome the increasing value of their home as though it were an asset are missing the point. Those who still have mortgages are simply celebrating an increase in their housing costs; if their house is a home then they have no greater value from it even if its financial value has doubled. As it turns out in Britain the house is not a machine for living in, as Le Corbusier once suggested, but rather a machine for increasing bank profits.